Happy to help you with creating your own website. If you are new to the internet don't be intimidated by website technology! You only need a host, a website designed with html, and (optional) a domain name. Some hosting companies offer inexpensive services. You can design your own website and put it on the net via the hosting company you choose. If you don't need a domain name ( ".com", ".org" etc.) you don't have to have it. However, having a domain name makes your url, the internet address, easier for people to remember. Having a domain name is not as costly as you might think! We use Anfy Host. They reserve domain names for as little as $1.49 per month (USD). 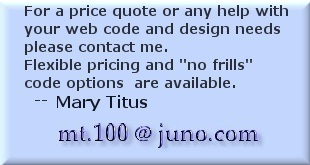 I have been designing and running websites since 2000 and know many cost saving options for starting a website. Today a website helps your business visibility.